India’s infrastructure sector grew exponentially between FY2013 and FY2017, primarily due to the government’s focus on sector development. The infrastructure sector struggles with complex regulations that the government has recently tried to ease while engaging private companies in PPP projects, perceived as less capital-intensive compared to projects carried out by single players. According to theGlobal Competitiveness Report 2017-2018 published by WEF, India has moved up by 40 positions from 2012 to its current ranking of 46 in 2018 in infrastructure quality. Strong pipeline projects in the infrastructure sector, significant investment from international companies, and the large size of the Indian market provide a strong base for sector growth. 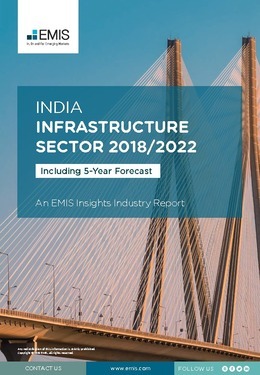 This report provides a complete and detailed analysis of the infrastructure sector for [country name]. EMIS Insights presents in-depth business intelligence in a standard format across countries and regions, providing a balanced mix between analysis and data. Build a clear picture of production and completed constructions for sub-sectors (e.g. transportation network, energy infrastructure and pipelines).